The shoulder joint is the most mobile of all of the main limb joints. While its primary motion is in a sagittal plane, the shoulder has a significant amount of abduction and adduction and internal and external rotation. Its stability is ensured by the joint capsule, the medial and lateral glenohumeral ligaments, and by large tendons located inside (tendon of origin of the biceps brachii muscle) or immediately outside the joint (supraspinatus, infraspinatus, teres minor, and subscapularis). The shoulder joint (or scapulohumeral joint) consists of a spherical humeral head articulating with a shallow glenoid fossa of the scapula. The stability of the shoulder joint is dependent on a complex interaction between active and passive mechanisms. The passive mechanisms (do not require energy expenditure by muscle) are the glenohumeral ligaments, the joint capsule, joint conformity, and the glenoid labrum. The active mechanisms (do require energy expenditure by muscle) are the muscles of the shoulder and the rotator cuff. The articular components of the shoulder are the glenoid cavity and the humeral head and they are connected by the joint capsule and the glenohumeral ligaments. It was previously believed that the rotator cuff muscles were responsible for maintaining joint stability; however, it is now established that the joint capsule and glenohumeral ligaments play a significant role in joint stability. The “cuff tendons” are four tendons that directly support the joint: the supraspinatus cranially, subscapularis medially, infraspinatus laterally, teres minor caudolaterally. The rotator cuff tendons act in concert with the joint capsule, glenohumeral ligaments and regional muscles to support the shoulder during movement. By contracting together, the cuff muscles press the humeral head into the glenoid fossa providing a secure scapulohumeral link. By contracting selectively, cuff muscles can resist displacing forces resulting from the contraction of the principal shoulder muscles. 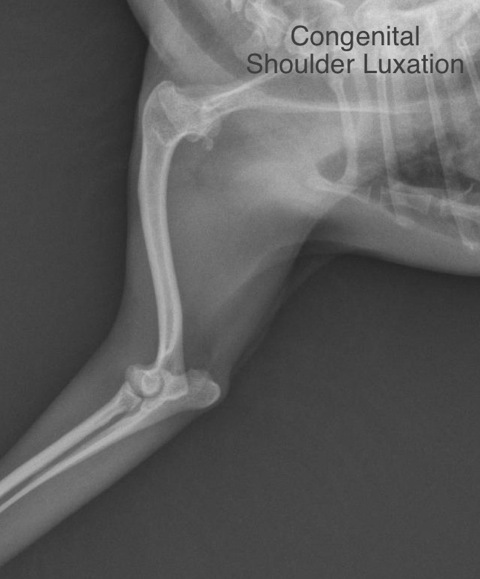 Scapulohumeral luxation is an uncommon injury in dogs and rarely occurs in cats. The majority of luxations are medial or lateral, as cranial and caudal luxations are rarely observed. Trauma and congenital malformation are the most common causes of joint instability. Medial luxation is the most frequently observed luxation. Medial traumatic luxation may be seen in all type of dogs. It is associated with a rupture of the medial gleno-humeral capsule and ligaments and disruption of subscapularis muscle. 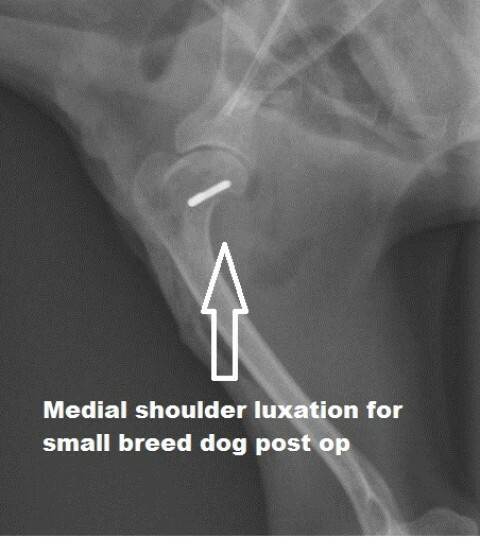 In small breeds, medial luxation is often congenital and may be bilateral, with an important component being developmental laxity or insufficient development of the glenoid cavity, which prevents any successful reduction. 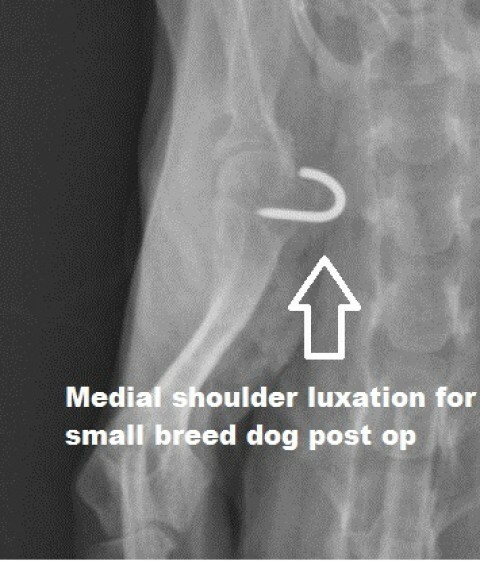 Lateral luxation occurs most often in large size breeds after trauma. It is associated with a rupture of the medial gleno-humeral capsule and ligament and a rupture of the infraspinatus muscle tendon. Affected animals may present with different degrees of lameness, which can range from mild intermittent to persistent unilateral forelimb lameness to complete non weight bearing lameness. After a traumatic luxation, the dog is usually non-weight bearing and holds the affected limb in flexion with external rotation of the foot. In contrast, dogs with a congenital luxation usually present as an intermittent to continuous lameness which is progressive in nature. Some dogs with congenital bilateral luxation however, show very little impairment in locomotion. On physical examination, the position of the greater tubercle and the acromial process are compared on both sides by bilateral palpation to reveal any sort of dissymmetry. The examination is performed with the dog in lateral recumbency and the affected shoulder uppermost. A cranial “drawer test” is performed to detect any possible cranio-caudal instability, in addition, the scapula can be immobilized with one had while the limb is abducted. Manipulation of the joint may or not be associated with crepitus, pain, muscle atrophy, possibility of reduction of the luxation, or some degree of ankylosis. The ability to abduct the limb away from the body for more than a 30 degrees angle is generally indicative of joint instability. In many cases, complete examination of the shoulder for signs of instability may need to be performed under anesthesia or heavy sedation. Flexion, extension, abduction, cranio-caudal translation, and rotational stability of the shoulder joint should be assessed. Normal range of flexion and extension are 40 degrees for flexion and 165 degrees for extension. Circumduction of the shoulder should not give rise to subluxation. Cranial and caudal translation should be similar in both shoulders. A normal abduction test is approximately 23 degrees; abnormal abduction is considered present when abduction exceeds this degree and there is a difference in abduction angle between the injured side and the normal side. When performing the abduction test, it is essential to maintain the limb in extension with the elbow in neutral position. If the elbow is externally rotated with the limb in extension, the shoulder joint will be internally rotated. The latter will give a false positive abduction test. To maintain the elbow in neutral position, the surgeon should place his thumb on the lateral surface of the olecranon caudal to the humeral epicondyle. Maintaining the thumb facing upward assures that the elbow remains in neutral position. Radiographic examination is necessary to confirm the diagnosis. On the medio-lateral view, the displacement of the humeral head may not be easy to recognise unless it is a cranial or caudal luxation. Typically, on a medio-lateral view, the glenoid should overlap the humeral head with a medial luxation. Care should be taken to observe for possible fractures of the medial glenoid rim which would preclude conservative treatment via closed reduction. The cranio-caudal radiographic view is usually more diagnostic in cases of medial or lateral luxation. Care should be taken not to reduce the luxation by extending the limb cranially when positioning the dog for radiographic evaluation. Radiography also allows for the diagnosis of secondary degenerative joint disease lesions which have been reported to occur in 57% of all cases of shoulder instability. The existence of concurrent fracture may also be assessed. Mild cases of shoulder instability may exhibit few or no obvious evidence of radiographic change and may require bone scan, CT or MRI evaluation or arthroscopy for definitive diagnosis. For an acute traumatic luxation, it is worthwhile to attempt closed reduction under general anesthesia. The surgeon extends the shoulder manually while lifting the humeral head into position with his free hand. If this is not accomplished easily, it may indicate a capsular flap that has fallen between the humeral head and glenoid thereby preventing reduction. In cases involving older luxations, an organized hematoma or fibrous mass may occupy the glenoid cavity preventing manual closed reduction. In either of the latter instances, open reduction will be necessary. If the reduction is stable during gentle extension and flexion, the correct positioning of the limb is confirmed with radiography and the limb is bandaged. A Velpeau sling (flexed shoulder, humerus bandaged to the chest wall, then flexed elbow and antebrachium bandaged to the thorax) is used for medial luxation, while a non-weight bearing bandage in physiologic position is used for lateral luxation. Care must be taken that the sling holds the shoulder in a stable position. Too much internal rotation of the humeral head will cause redislocation. The most stable position is that of the forepaw rotated sufficiently to be near the opposite shoulder, thus promoting lateral positioning of the humeral head. Animals should remain immobilized in this fashion for 2 to 3 weeks. Results of nonsurgical treatment of scapulohumeral luxation depend on the magnitude of soft tissue injury, success of the splintage and compliance with activity restriction. If gentle manipulation after splintage and reduction results in reluxation of the joint, surgical stabilization is necessary. Open reduction and surgical fixation has been used successfully extensively in cases of shoulder luxation that cannot be stabilized by closed reduction. Transposition of the biceps brachii tendon is the technique preferred for treatment of lateral, medial, and cranial shoulder luxation. In cases of medial luxation, a caudo-medial transposition of the biceps tendon is performed. Surgically, a craniomedial parahumeral incision is made, beginning 4 cm dorsal to the shoulder joint and extending to a point midway down the humeral shaft. The skin and subcutaneous tissues are then reflected, and the medial border of the brachiocephalicus muscle is separated from the superficial pectoral muscle for the length of the incision and is retracted laterally. This exposes the superficial and deep pectoral muscles, the supraspinatus muscle, and the distal communicating branch of the cephalic vein. The insertion of the superficial pectoral muscle is transected down to the border of the distal communicating branch of the cephalic vein and is retracted medially to expose the deep pectoral muscle, which is incised in a similar manner along the length of its insertion on the humerus. This muscle is then retracted medially. The fascial attachment between the supraspinatus and deep pectoral muscles is also incised to allow full medial exposure of the shoulder joint At this point, the tendinous insertion of the subscapularis muscle, crossed by the tendon of the coracobrachialis muscle, is visible, as is the medial aspect of the joint capsule. The insertion of the subscapularis is elevated and detached from the lesser tubercle and is reflected medially. The tendon of the coracobrachialis muscle lays craniomedially and is retracted with the subscapularis. The tissues over the bicipital groove and the intertubercular ligament are transected, and the dorsal aspect of the joint capsule surrounding the bicipital tendon is incised to allow mobilization of the bicipital tendon from the intertubercular groove. At this point the joint may be inspected. The biceps tendon is held in its new position by a bone screw and a spiked washer or a U-shaped surgical staple which is implanted in such way so that the tendon is not compressed. The medial aspect of the joint capsule is reefed and closed routinely. The subscapularis muscle is tightened by advancing its free end anteriorly toward the crest of the greater tubercle of the humerus. It is sutured near the insertion of the deep pectoral muscle. The deep pectoral muscle is then closed over the greater tubercle to the fascia on the lateral surface of the crest and the deltoid insertion with interrupted sutures. The superficial pectoral muscle is closed over the deep pectoral muscle in a similar manner. The brachiocephalicus muscle is closed to the superficial pectoral muscle. The subcutaneous tissues and skin are closed routinely. The leg is placed in flexion in a modified Velpeau dressing for two weeks. For cases involving lateral luxation, the technique of greater tubercle osteotomy and bicipital tendon transplantation mimics the method used for medial luxation; however, here the biceps tendon is repositioned on the lateral side of the shoulder joint to provide lateral “collateral” support. The skin incision and retraction of the superficial tissues are the same as for medial luxation. The brachiocephalicus muscle is retracted medially, exposing the cranial aspect of the proximal humerus and the insertions of the supraspinatus, deltoideus and superficial and deep pectoral muscles. The insertion of the superficial pectoral muscle is transected down to the border of the distal communicating branch of the cephalic vein, and the muscle is retracted medially, exposing the insertion of the deep pectoral muscle. The deltoideus muscle is transected in a similar manner. The exposed insertion of the deep pectoral muscle is elevated from the humerus and retracted medially, exposing the biceps brachii muscle and the tendon in the intertubercular groove. The intertubercular ligament is incised, and the biceps tendon is freed from the surrounding fascia and joint capsule. The greater tubercle is osteotomized so as to reflect dorsomedially the intact tendon of the supraspinatus muscle. The joint capsule is incised dorsally to free the full tendon of the biceps brachii to facilitate translocating it laterally on the opposite side of the osteotomized greater tubercle. The cut portion of the greater tubercle is replaced and fixed in position with two Kirschner wires. The dorsal joint capsule is closed and the capsular attachments near the intertubercular groove are sutured. Several sutures are placed through the bicipital tendon and the tendinous insertions of the supraspinatus, infraspinatus and teres minor muscles to immobilize the tendon. The muscles are reattached routinely as in the medial luxation. The limb is bandaged for 15 days with a nonweight bearing bandage. A velpeau sling promotes lateral translation of the humeral head so its use is avoided in patients with lateral luxation. In the case of a (much less common) cranial luxation, the biceps tendon is transposed cranially, into a groove created in the greater tubercular osteotomy site, then immobilized by returning the tubercle to its initial position and securing it with two Kirschner wires or pins. In cases of (even less common) caudal luxation, imbrication of the lateral and caudolateral joint capsule has resulted in good return to ambulatory function. In cases of recurrent surgical luxation, major degenerative joint disease, dysplasia of the glenoid cavity or extensive instability, excision arthroplasty or an arthrodesis may be required as salvage procedures required. Open reduction and fixation using a biceps tendon transposition for medial and lateral shoulder luxations in the absence of concurrent fractures or significant joint abnormality has a good prognosis for success and return to normal to near normal function of the shoulder. Likewise successful closed reduction and fixation, when possible, has the same prognosis. Many studies report satisfactory results in greater than 90% of the cases managed with conservative medical and/or surgical intervention.